Andrey Yanchenko, Head of Sales Engineering at NetCracker. I got used to working with Outlook and wouldn’t like to change it. I use it to assign and track and manage Outlook tasks, share my calendar, exchange work files, and to send, receive and discuss tasks in emails. It’s a great collaborative system yet I would like to get more out of it. I want it to be coupled with workflow software. Processes behind my tasks will coordinate team work while I am not going to have to switch between applications to see my full to-do list. My personal tasks and team workflow tasks will be synchronized together in one Outlook list of tasks. To make it fully collaborative, I’d like to have comments tread for each working task, too. Comindware Tasks for Outlook is a free Outlook add-in that you can get right from your Comindware Tracker account. It puts Comindware Tracker workflow system behind your Microsoft Outlook. The add-in is light and invisible. And gives you the power of collaborating on workflows and tasks with your team directly from your Outlook. 1. Workflow enables you to collaborate in team. It divides a process into steps and gives a task to the responsible at each step. As it is performed automatically by Comindware Tracker, you don’t need to write an email to your co-worker saying that your part of work has been accomplished, give details and attach documents: you save it together with your task and then it automatically goes to the next on your team, with all the content and the context. 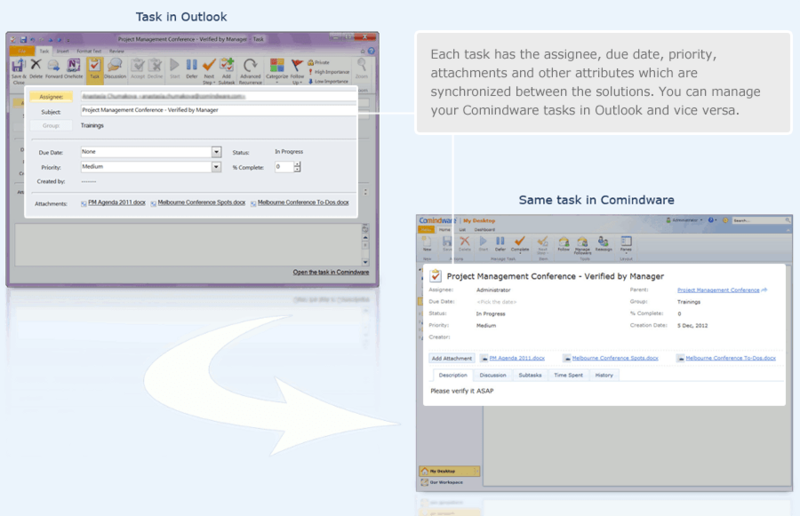 synchronization between Outlook and Comindware Tracker lists of tasks. 3. All in one: emails, calendar, team collaboration, tasks, attachments, workflow. You don’t need to switch between solutions when they are united by a single Outlook plug-in, and all of the tasks and their content are synchronized automatically between solutions. 4. It’s powerful. Comindware Tasks for Outlook is spared from any excessive features which makes this add-in really light, so that it does not slow your MS Outlook by any means: it’s really quick. 5. 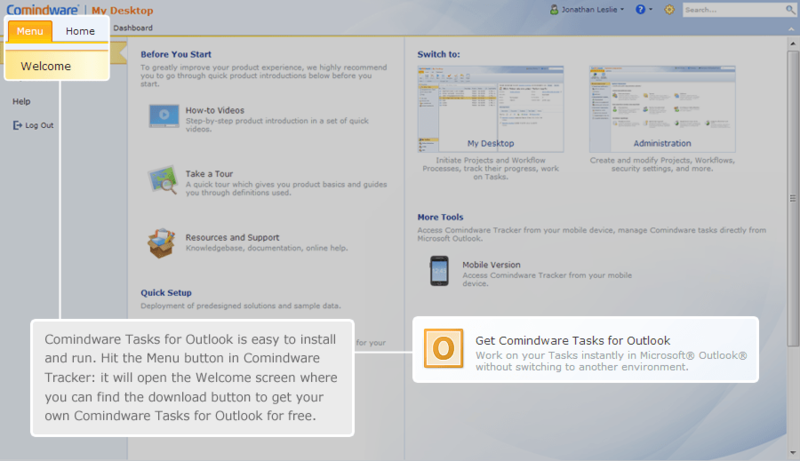 You don’t need to learn anything new to work with Comindware Tracker through Outlook. The ribbon interface is already familiar to you, and you only get much larger functionality. 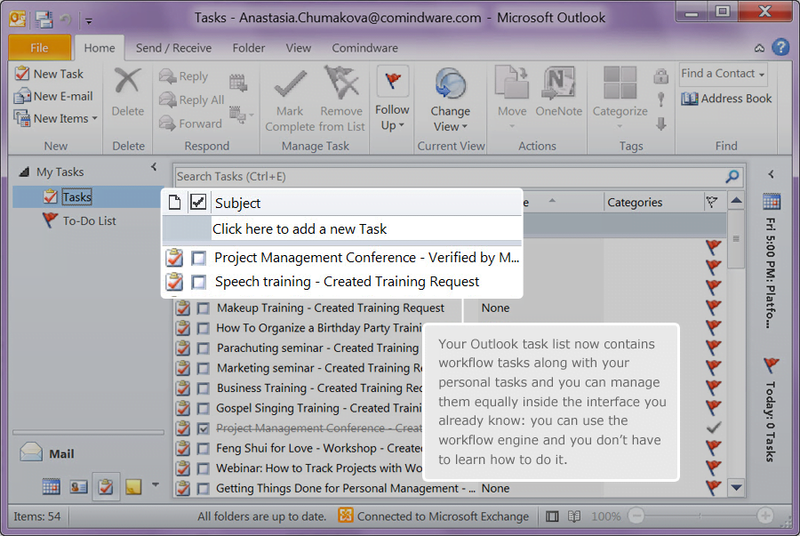 Comindware Tasks for Outlook goes in the package with Comindware Tracker, and it’s free for Comindware Tracker users. Log in to your account in Comindware Tracker and hit the Menu tab. 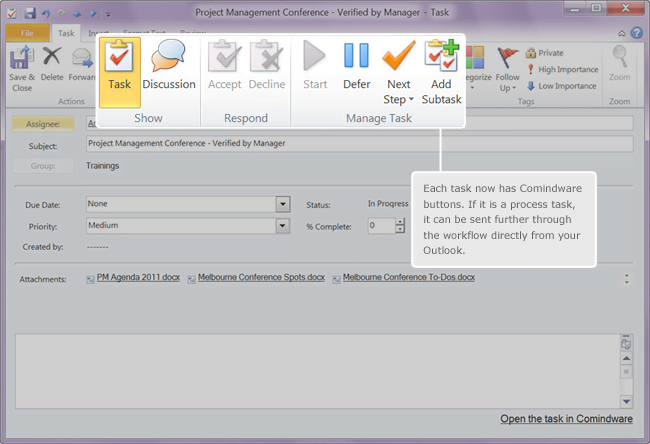 You will see the button that will get Comindware Tasks for Outlook Add-In installed on your computer. Comindware Tracker and Microsoft Outlook are tightly integrated with the help of Comindware Tasks for Outlook. 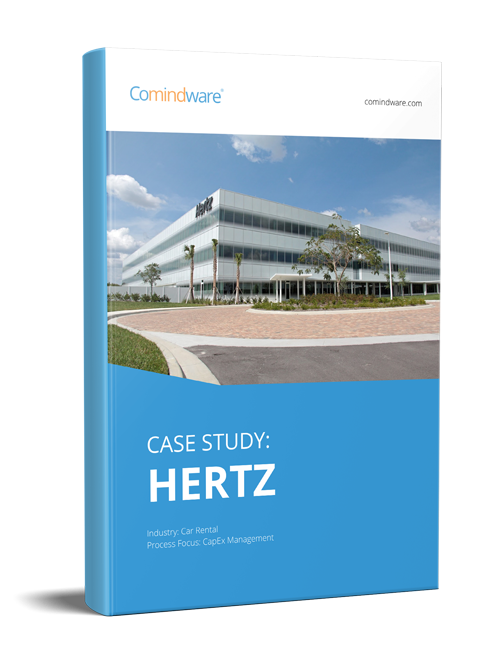 Other third party applications can be integrated with Comindware Tracker through web-based API. Let’s take an example of Comindware Tracker integration with SalesForce: this is the subject of our next topic.